If you’ve followed my Tech Tips for a while, you know that I’m a strong proponent of having good backups. I’m also an avid Lightroom user. A common question many Lightroom users have is how to back up Lightroom so you don’t lose your work. Lightroom catalogs can become corrupted and fail to open, so it’s critical to have good backups. It’s also helpful to have a good backup in case you make a change like removing a folder of images from your Lightroom catalog that you need to restore. Backing up your Lightroom catalog is actually fairly easy, but you need to enable it and make sure you understand how it works. What is a Lightroom Backup? The backup function in Lightroom backs up all your Lightroom data by making a copy of your entire catalog file. So to understand what is contained in a Lightroom backup, you need to understand what the Lightroom catalog is. The Lightroom catalog is a database that contains all the data about the images you import into Lightroom. It does NOT contain the images themselves though, and this is a common confusion. My Lightroom catalog contains about 100,000 images and is only about 2GB in size. Lightroom catalogs are essentially a list of all of your images with their folder locations, plus all the keywords, captions, flags, ratings, and other metadata for each image, and of course, the editing instructions for each image. Catalog backups are stored as zipped files once they reach a certain size, so you will need to unzip the catalog backup if you need it. This saves space on your computer and has the added benefit of preventing you from accidentally opening a Lightroom backup catalog when you don’t mean to. But what about your photos? 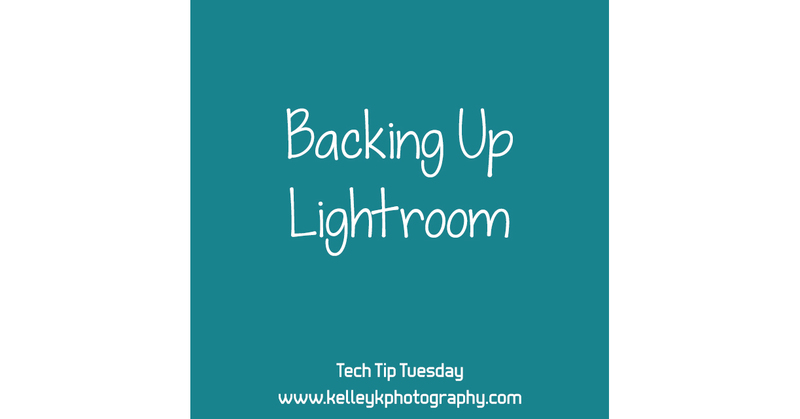 Because Lightroom catalog backups do NOT backup your photos, so you need to back up your images separately. Please see my other tech tip on backing up photos and other files. Lightroom can be set to periodically prompt you to backup the catalog when you exit Lightroom. The frequency of these prompts is controlled in the Lightroom catalog settings. Access Catalog settings from the Edit menu (PC) or Lightroom menu (Mac). Choose a frequency of once a month, once a week, once a day, or every time Lightroom exits. I like to keep this set at once a day or every time I exit Lightroom, but I will skip the backup when prompted if I haven’t made any significant changes that day in Lightroom. You can also tell Lightroom to back up the catalog the next time you exit Lightroom. This is helpful if you want to force Lightroom to run a backup at a specific time, such as after making major changes, or when you want to change the backup location. When prompted to backup, you are presented with a few options. You can change the backup frequency from this window if you’d like. You can also change the location of the backup folder. I highly recommend using a backup folder on a separate physical drive than your Lightroom catalog is stored on. My Lightroom catalog is stored on my C:\ drive, which is my computer’s primary hard drive (a solid-state drive), and my backup folder is located on my D:\ drive (my main storage drive, where my photos are stored). By keeping your backup on a separate drive than your catalog, your catalog backups will be safe if your primary drive fails. There are also options to test the catalog integrity and optimize the catalog. I recommend keeping both of these check boxes enabled always. That way, every time you backup your catalog, Lightroom will first check your catalog for any corrupted data and then after backing up, it will analyze the catalog and make speed and efficiency improvements. These steps add some time to the backup process, but they are important if you want to keep your catalog error-free and working smoothly. On Macs, some versions of Lightroom 6/CC give an erroneous warning message that says: “Catalog size is more than 4 GB. Your catalog size is larger than 4 GB. Please use a 3rd party utility such as 7-zip or StuffItExpander to extract your catalog backup.” This message appears even if your catalog is under 4GB, and it can safely be ignored. Just select “Don’t show again” and click Continue. This issue was corrected in LR 6.9/CC 2015.9. The one down side of Lightroom backups is that Adobe doesn’t have any process for cleaning out old backups, so they will eventually take up a lot of space, especially if you are backing up daily. To deal with this, set yourself a reminder to periodically clean out old backups. I do this once every three months. I always recommend keeping a few old backups in case you need to go back in time a ways, such as to find something that was accidentally removed from Lightroom months prior. I usually keep one backup per month for the previous 3 months, then one backup per quarter for the previous year, then one backup for each year for prior years (usually I keep the last backup from each period). Here are the Lightroom backup catalogs that I have saved currently based on the schedule I described. Of course you don’t have to follow this exact schedule, but the idea is that you want to keep at least several recent catalogs. And I think it’s best to keep a few older catalogs spanning over time, just in case. Catalog backups are fairly small, so it’s not usually a big deal to keep a few extra old catalogs in case you ever need to go back to them. This tip should help you get your Lightroom backup strategy under control. If you need more hands on help with managing and backing up your Lightroom catalog(s), I am available for mentoring / consulting, either over the phone/web or in person (if you’re in the Atlanta area).